Good afternoon everyone! Today I’m featuring not one – but two – new outfits from Missguided, a women’s fashion online store from the UK. A couple months ago, I was introduced to Missguided after ordering a pair of wide legged pants from their petite section. (Again, with the wide legged pants – you can never have enough!) I fully expected to take them to a tailor (because I’m so petite) but was pleasantly surprised to see that they fit me perfectly – right out of the package! Then I started thinking, “surely everything else has to fit this way too?” And I got really, really excited because this never happens! 9/10 I have to take something to the tailor or fix it myself. Missguided’s price points are super reasonable, too. Almost everything on the site is under $100. Sure, don’t get me wrong, I love splurging on investment pieces that I’ll have forever (like a designer handbag or designer shoes or sunglasses) but it’s nice to shop from a great selection of fashion forward clothing that don’t cost an arm and a leg, too. Thus, allowing me (or you!) to try trendy items without feeling guilty years from now. If you’re into the crop top trend, like me, then you definitely need to consider this one. It’s made out of a crisp, clean white fabric that looks great with a flowy midi skirt and sandals or with high waisted cigarette pants for a sweet evening look. [NOTE: it’s short!] Definitely planning to bring it with me to New York Fashion Week! I’m LOVING these white hot sandals too. Teamed with this outfit or with distressed jeans (see below for more) they are SO fierce contrasted against tanned summer skin. For my next look, I paired a white tee with jeans. I wanted a cool girl vibe so I threw in a lightweight bomber jacket and aviator sunglasses. Even though it’s scorching hot in South Florida, this bomber jacket (for $24) is quickly becoming a favorite. It’s soft to the touch and has a killer fit. 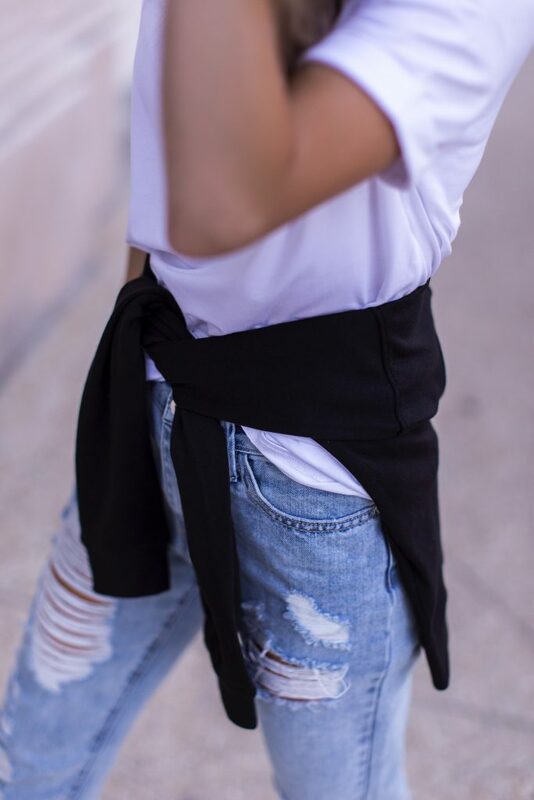 Throw on with jeans and a tee or with slouchy pants. Everything featured in today’s post is a size 00-0P or 0. Be sure to comment below if you have any questions about fit or quality and I’ll try to answer them ASAP! Mega P.S. : Guys get ready for a crazy month. I’m in Portugal this weekend. Then New York Fashion Week. And finally to Vancouver for my best friend’s wedding. I’m anxious yet excited to travel all month! Comment below with your recommendations! Next articleCity to Beach Trip! Oh my gosh, you look gorg in both outfits! Loveeee that cropped top! I also love your hair. That side part is rockin, girl!